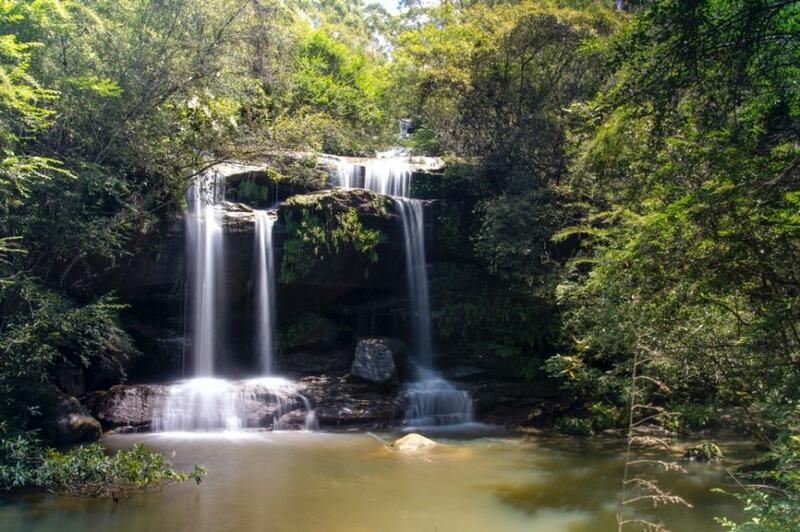 Dundundra Falls Reserve is a 40 hectre Crown Land reserve in Terrey Hills, northern Sydney. It is home to a variety of plant habitat and native animals and birds. Also as the name implies it has waterfalls. Kieriens creek makes it's way through the reserve and meets up with Neverfail Creek with a series of falls and cascades along the way. The reserve is located on the southern side of Aumuna Road Terrey Hills. A fire trail, Larool Trail, runs along the eastern boundary connecting Aumuna Road to the southern part of Larool Road. It adjoins Dardabong Reserve which contains aboriginal rock carving to the south. The reserve is Crown Land (i.e. the land is owned by the state government of New South Wales). The management of the reserve is done by a Land Manager group of volunteers from the local community under the guidance of the Crown Lands department. The reserve can be used by all members of the community for walking, horse and bike riding. It is a great place to explore and appreciate the variety of the local vegetation and terrain and wildlife. Much work is done throughout the reserve to control weeds and plantings to regenerate native bush. This is done by volunteers. Also various grants over the years have funded regeneration efforts. The bush regeneration group meets on the first Sunday of the month 8:30-11:30am (warm seasons - get the work done before the heat) 9:00-12:00 (cooler seasons - we all like our warm beds in winter) . All are welcome, so come and say hi, ask questions, see what we do and join in or send us an email. Training in bush re-gen and OH&S is provided. Let us know if you have any questions or suggestions or anything.